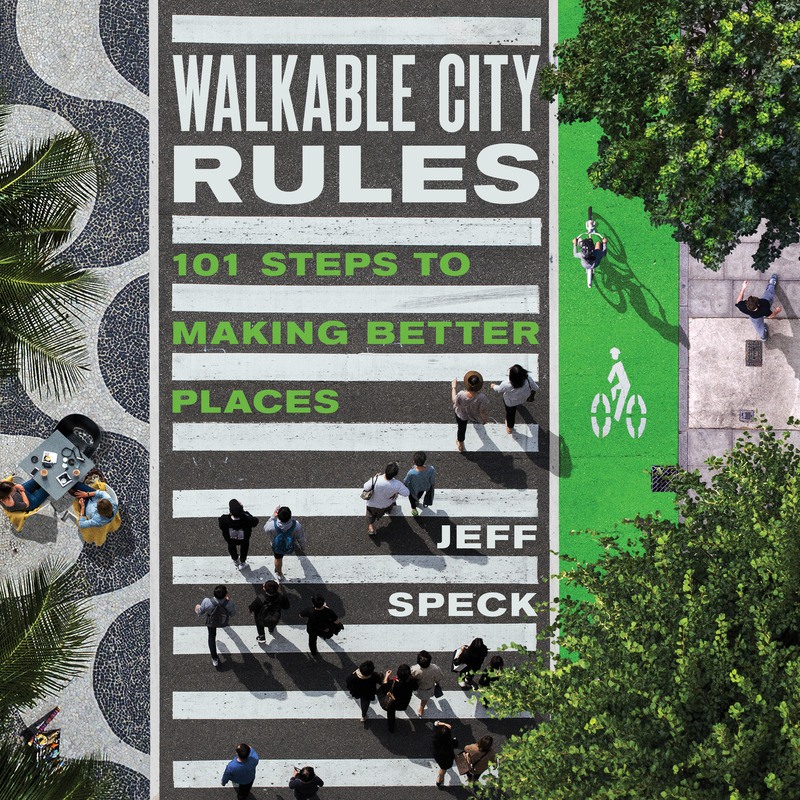 Island Press has granted Streetsblog the exclusive right to publish excerpts from Jeff Speck’s new book, Walkable City Rules. We are sharing them in conjunction with the book’s release in October. Into this mix, we can throw two additional ingredients: union make-work and the fire-equipment up-sell. Over the years, firefighters’ unions have introduced contractual language stipulating the minimum number of firefighters on a call. Simultaneously, firefighting equipment suppliers have infiltrated the ranks of the organizations drafting official guidelines for firefighting equipment. 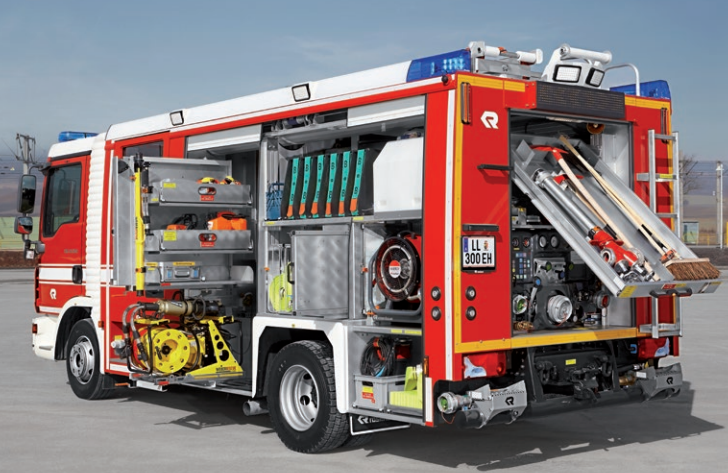 The unsurprising outcome: ever larger fire trucks. As a result, most cities have found themselves under the protection of fire chiefs who, when introduced to the planning conversation, advocate for three things that make their cities more dangerous: wider streets, broader intersections, and the introduction of unwarranted traffic signals. Wider streets: Rule 50 discussed eight-foot lanes and two-way, 12-foot lanes, two things that increase safety in most older, walkable cities, and which are impermissible according to something called the “20-foot clear.” The 20-foot clear appears in the Universal Fire Code — not a law, but a standard that many cities adopt—and requires that all streets maintain 20 feet of clear space between any obstructions such as parked cars. Many fire chiefs apply this law indiscriminately, not realizing that it hails from cul-de-sac suburbia, where there is only one path to each fire. When a street can be entered from both ends, there is no longer a need to do what the 20-foot clear allows, which is to park a big truck, put down its stabilizers, and drive another big truck past it. Some fire chiefs, but not all, are willing to reject the 20-foot clear once they learn that it was written for cul-de-sacs. Unwarranted traffic signals: As demonstrated ahead in Rule 76, replacing unwarranted signals with four-way stop signs results in great reductions in injuries. But fire chiefs prefer signals, because only with signals can you have signal preemption, which allows you to clear an intersection of cars as the fire truck approaches, speeding response time. And a faster response time is good. But, as with the other two examples, not at the expense of life safety. If wider streets, broader intersections, and unwarranted signals all improve response time, while killing and maiming untold numbers of citizens in the process, it is clear that the cart is leading the horse. It will continue to do so until mayors and city managers provide their fire chiefs with different performance metrics, and a different job mandate. British roads (and fire trucks) are much narrower, but I’ve never seen evidence that this impedes their ability to respond sufficiently quickly to avoid loss of life. There’s also one more statistic missing. How many injury calls result in an unnecessary fire truck deployment. In era of cell phones, I think it’s exceedingly rare to not know that a big fire truck with 1000 gallons of water (8000+ lbs) is not needed for a pedestrian vs car accident. Another factor to consider is that in most cities, fire departments spend far more time responding to traffic collisions than actually fighting fires. If you make the streets safer, then the fire departments can do more with less! I was recently discussing this with a local fire captain at a neighborhood meeting in which walkable streets were a key issue. He assured me (a traffic engineer) that I was wrong and smaller fire trucks and narrower streets were completely out of the question. Then showed me on his phone how many service calls were active at the moment. I asked how many were fired, he said none, but that didn’t matter. …ever feel like you’re standing at the base of a very steep mountain? But clearly they need a ladder truck racing down the street for that fender bender. I mean, what if the building next door spontaneously combusts? Response time is important because of biology, not because it’s a check mark on the fire chief’s performance review. If you’re having a heart attack, for example, for every minute that passes before you receive advanced life support, you have a 10% less chance of surviving. Minutes are critical when you’re bleeding or had a stroke or are undergoing many medical emergencies. well, your fire captain may not know much about street planning, but you don’t seem to know anything about emergency medical response so maybe you are even. It doesn’t matter if the truck is going out to a fire or a medical call. It still has to get there, and response time is important, perhaps not to the person strolling down the street, but it is critical to the family whose loved one just had a stroke or a heart attack or is choking. It’s a matter of human biology, and you can pass all the ordinances and write all the policy documents you want, but that has no effect on how the human body processes traumatic events. here’s an idea for cities – make sure all areas served by their fire departments have a robust water supply. If there are fire hydrants & water lines, one won’t need a pumper truck nearly as often. So how does a ladder truck help a stroke victim? It’s not ambulances that have wide turning radii. Pugh altered a bikeway as it was being constructed, endangering the physical safety of people on bikes to appease parking-obsessed complainers.